My 2001 Whirlpool refrigerator has stopped cooling anything. 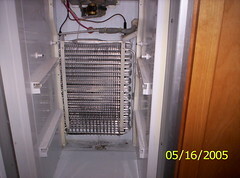 It still runs and I believe the fan must be still working – but the air being blown into the icebox is not cold. Nothing freezes and nothing is cold in the main part of the refrigerator. Is it worth it for me to pay a repairman $65 just to come look at it or should I just buy a new one. P.S. I vacuumed any dirt that was on the coils but that didn’t help. 7 years for a fridge seems so short. This is bad. Remember, we’re looking at this coil with the compressor running, so if everything was peachy, I’d expect to see a light sheen of frost on 2/3 of the coil. No frost at all means either the compressor is “plum wore out” (that’s a technical term, please don’t use it unless you have a valid EPA refrigeration certificate) or the freon has leaked out. Either way, for most refrigerators today, that means you’re going shoppin’. This is also bad, and same deal as above. Same remedy, too. This is good! This indicates a defrosting system failure which is a simple control problem. It also means that the sealed system (compressor, evaporator coil, and all associated tubing) is fine as wine in summertime. 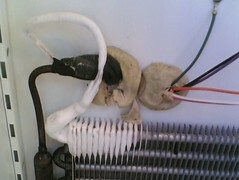 Defrost system problems are easy fixes that anyone with a pulse can do with maybe just a little help from their friends. The problem will either be the defrost timer (or Adaptive Defrost Control board, if so equipped), the defrost thermostat, or the defrost heater. To locate these parts in your fridge, check out these cool, interactive parts diagrams. If you’re still confoosed about disassembly or about what you’re seeing, come talk to us in the Samurai Appliance Repair Forums for personalized, interactive help from Master Appliantologists, including yours so very freaking truly. 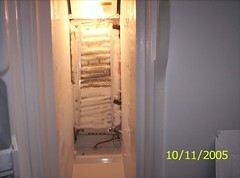 This entry was posted in Refrigerator Repair on May 8, 2008 by Samurai Appliance Repair Man.